No village merchant was more recognized and more enjoyed during most of the 20th Century than Aldo Travaglini. Known to many thousands of his customers as “Squash,” Travaglini was a center of the Main Street scene from the late 1920s until the 1990s. His news store was as much a part of the village as the town hall — and was often busier and newsier. Decades of commuters in the morning or evening “would stop by Squash’s to pick up the paper and check out the local talk,” Gerri Lewis reported in The Ridgefield Press in 2000 when Squash was named Lions Club Citizen of the Year. “It was here that you’d find out how the high school football team was doing, what was going on in local politics, and all the other gossip. Aldo Travaglini was born in Ridgefield in 1914, the sixth of seven children and the first to be born in America. He got his first job when he was 14. The store was Bissell’s Pharmacy and the year was 1928. 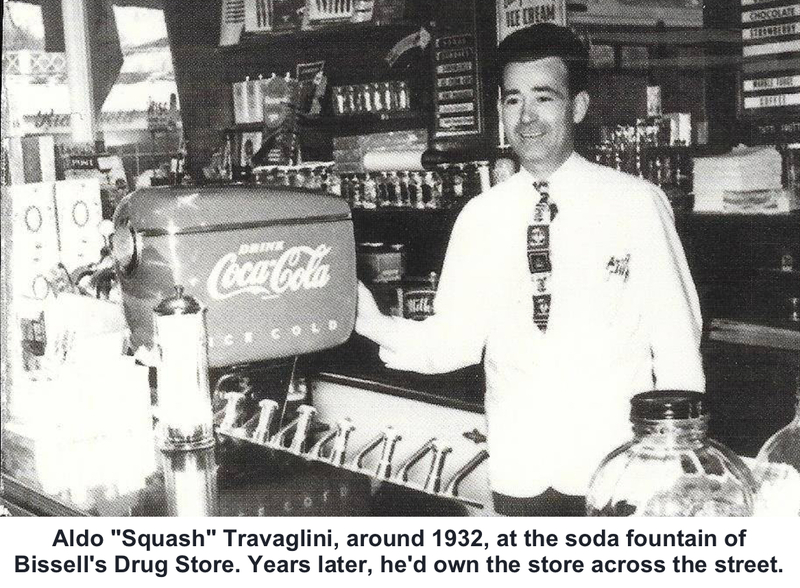 Squash went on to spend nearly 70 years working in retail on Main Street. At Bissell’s he ran the long-famous soda fountain (some say he was nicknamed “Squash” after his older brother, Louis, longtime state and town police dispatcher, who had worked at Bissell’s a few years before him). He remained at Bissell’s until 1953 when he bought the United Cigar Store from David Moore and his wife, Alice, who was daughter of Harold Finch, the store’s founder. He renamed it Ridgefield News Store, selling newspapers, magazines, cards, and stationery — and, until around 1970, maintaining a popular soda fountain. 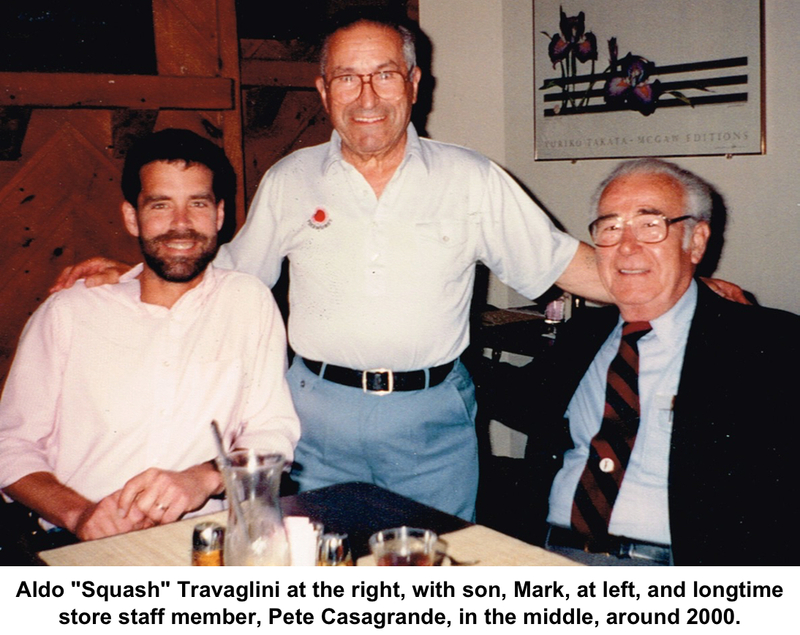 Travaglini was beloved as a first boss, and many former employees, returning to town, would always stop by. In 1989, he sold the business to his son Mark, who in turn sold in 1994 to owners who changed the emphasis from publications to office supplies and stationery. Travaglini continued to work there until the mid-1990s. Then, after stints at a couple of other local businesses, he retired to his longtime home in Goldens Bridge, N.Y. In 2002, he received a Ridgefield Old Timers award, recognizing his many years of sponsoring youth sports teams and events. He died in 2007 at the age of 93. It was Squash playing a nostalgic joke on Marconi, but none of the people the candidate was talking to knew that. “I was never so embarrassed in my life,” Marconi — wearing a big smile — told Travaglini a few years later.